Previously sold at Sotheby's Hong Kong, 29 October 1991, lot 29. Yongle flasks of this form, design and large size are illustrated by J. Ayers, Far Eastern Ceramics in the Victoria and Albert Museum, London, 1980, no. 145; by R. Krahl, Chinese Ceramics in the Topkapi Saray Museum, Istanbul, London, 1986, vol. II, no. 616; included in the Exhibition of Famous Pieces of Chinese Porcelain in the Matsuoka Museum of Art, Japan, 1983, illustrated in the Catalogue, no. 48; in the Exhibition of Blue and White, Chinese Porcelain and its Impact on the Western World, Indianapolis Museum of Art, 1985, illustrated in the Catalogue, no. 15; and sold in these Rooms, 27 October 2003, lot 628. 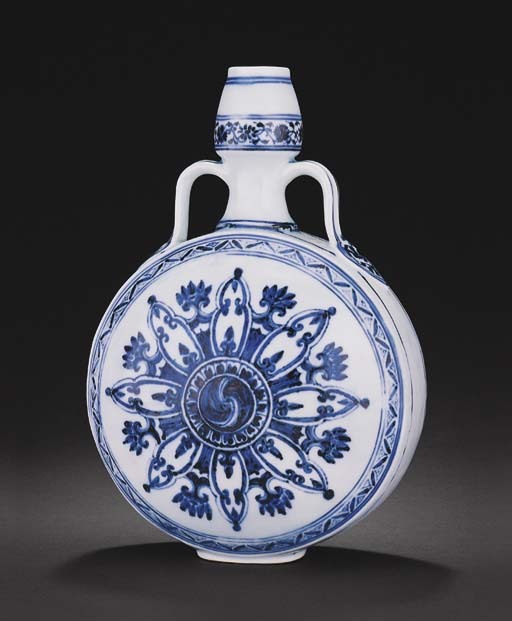 Smaller flasks with the same decoration are also known in famous museum collections: one from the Shanghai Museum, illustrated in Underglaze Blue and Red, Hong Kong, 1987, pl. 52; one from the Percival David Foundation, London, illustrated by D. Lion-Goldschmidt, La Porcelaine Ming, Fribourg, 1978, pl. 35; two published in Mayuyama, Seventy Years, vol. 1, Tokyo, 1976, p. 247, nos. 743 and 746; and another in the British Museum, included in Oriental Ceramics, Kodansha Series, Japan, 1980, vol. 5, no. 164. These moonflasks were made primarily for export or as gifts to Near Eastern rulers. For the origins of its shape and decoration, see J. Pope, 'An Early Ming Porcelain in Muslim Style', Aus der Welt der Islamischen Kunst, Festschrift fur Ernst Kuhnel, 1959; B, Gray, 'The Influence of Near Eastern Metalwork on Chinese Ceramics', Transactions of the Oriental Ceramic Society, 1940-41, vol. 18, p. 57 and pl. 7F; and M. Medley, 'Islam and Chinese Porcelain in the 14th and Early 15th Centuries', Bulletin of the Oriental Ceramic Society of Hong Kong, no. 6, 1982-84, fig. 11. Please note that the height of this vase is 32.5 cm. high and not 21.5 cm. as stated in the catalogue.